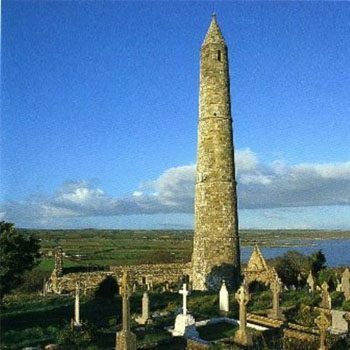 Irish round towers were built between from c500 to c1200 generally in the vicinity of monasteries and churches. Structurally they conform to a specific design unique to Ireland. Given their great height – up to 40m/130ft – and with four windows located at the top facing the cardinal compass points, it is likely that they served as lookout towers and landmarks. Round towers may also have served as repositories for the monastery’s treasures such as chalices and illuminated manuscripts. All the towers follow a similar design and pattern of construction so it is safe to assume that they were the work of teams of builders that moved from one monastery to another. Many historians believe that Irish round towers were primarily used as belfries. As such, they would have served various religious functions, such as calling the monastic community to prayer. The tolling of the bells may also have warned the monks of impending danger. Christian annals document that during Viking raids monastic communities sought refuge in round towers although it is unknown that they were built with this purpose in mind. It has also been discovered that the seemingly random geographical arrangement of the round towers mirrors the positions of the stars in the northern sky during the winter solstice. Archaelogical excavations have revealed that the towers were erected on top of much older graves and that they were sacred sites long before the arrival of Christianity in Ireland. 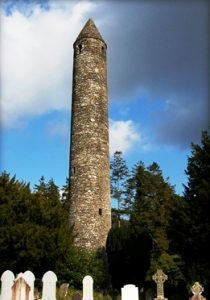 Approximately one hundred round towers have survived including some fine examples at Glendalough, Co.Wicklow; Timahoe, Co.Laois; Ardmore, Co.Waterford; and the Rock of Cashel, Co.Tipperary. Thirteen towers still retain their conical caps. It’s assumed that the others fell in over the centuries while on a small number of them battlements were added possibly during the Middle Ages.